How should I store my box of Fretzels? I'm having a party/get-together. How many Fretzels should I order per person? 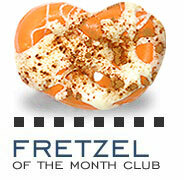 I'm a Fretzel of the Month Club Member, when does my Fretzel of the month arrive? What if I place my order during the summer months or have it shipped it to warm climates? Do you sell Fretzels wholesale? Do you ship Fretzel boxes to international destinations? Q. How should I store my box of Fretzels? A. To maintain freshness and flavor, keep in a cool, dry place (ideal temperature, 65-68 degrees Fahrenheit).Keep away from heat and direct sunlight. For best quality, do Not freeze or refrigerate. Q. I'm having a party/get-together. How many Fretzels should I order per person? A. A general rule of thumb is 2-3 Fretzels per person, depending on what other desserts are being served. Q. I'm a Fretzel of the Month Club Member, when does my Fretzel of the month arrive? A. Orders should arrive at your door the first full week of each month. A. Yes. For corporate gifts and favors (wedding, baby shower, anniversary, birthday, bar/bat mitzvah, etc. ), we can customize the color of the chocolate, as well as the packaging i.e. : logos, corporate colors, or themes. Additional charges may apply. Contact us for more information. A. Some Fretzels are made with products that contain nuts/peanuts, and since all Fretzels are made in the same facility, there is a chance that any of our Fretzels may contain traces of nuts/peanuts. If you are allergic, we recommend you not consume our product. We apologize for this inconvenience. Q. What if I place my order during the summer months or have it shipped it to warm climates? A. When placing an order during the summer months (April 15th-Sept 30th), or to warm climates (above 70 degrees Fahrenheit) all orders must be shipped with cold packs, for an additional charge of $6.00 and we highly recommend shipping via Next Day Air. Due to the delicate nature of the chocolate, if the customer chooses not to ship this way, Fretzels by Jill, Inc. cannot guarantee the shipment will arrive without melting. Q. Do you sell Fretzels wholesale? A. Yes. Please contact us if you are interested in selling Fretzels at your store. A. It takes approximately 1-3 business days for orders to be processed and shipped out. Time in transit depends on selected shipping method. A. We accept Visa, Mastercard, American Express, and Discover. A. Sales tax is only collected for New York Sate customers, which is 8.625%. A. If you must cancel your order, please email customerservice@fretzels.com within 12 hours after placing your order with "ORDER CANCELLATION" in the subject line. A 5% cancellation fee may apply. Once an order has been shipped, it cannot be cancelled. Q. Do you have a catalogue you can send me? A. No, we do not have a catalogue at this time. However, all our products may be viewed on our website, www.fretzels.com. Send this link to a friend, today. Q. Do you ship Fretzel boxes to international destinations? A. Currently, we only ship to addresses in the continental U.S. (no P.O. Box addresses). For packages to Alaska or Hawaii, please contact us for shipping information.